On February 9, 1811 Robert Fulton received a patent for the steamboat, an invention that revolutionized American transportation and commerce. Fulton’s steamboat the Clermont had already taken its first voyage in 1807, going from New York to Albany and launching the first commercial steamboat service in the world. 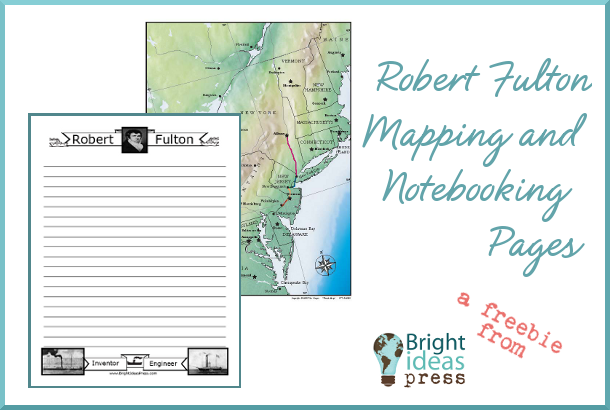 Our February freebies include a map for charting the waterways where Robert Fulton’s boats traveled and notebooking pages (both lined and unlined) for facts about the inventor. A map answer key is included as a separate file. If you use these pages in your homeschool, we’d love to hear about it or see photos. Connect with us here via comment, on Google+, Facebook, or Twitter.